Democratic Rep. Eric Swalwell (Calif.) on Monday was still unable to provide evidence that the Trump campaign colluded with Russians during the 2016 presidential campaign. CNN host Poppy Harlow expressed impatience with Swalwell, who serves on the House Permanent Select Committee on Intelligence, over the lack of hard evidence linking the Trump campaign to collusion. "So, you know, it's been–there are some Americans who have fatigue, right, on this? And they say, ‘show me the evidence, show me the evidence, show me the evidence,'" Harlow began. "And that is incumbent on your investigations … No one wants to rush that. But have you seen, Congressman, anything to this point that you can say to Americans right now, you will be convinced beyond a reasonable doubt that there was collusion here between anyone on the Trump team and the Russians? Have you seen anything to that effect yet?" After recalling a time seven months prior when Harlow asked the lawmaker the same question, Swalwell said "It does seem when you're in the thick of it, it doesn't move as fast as you'd like." Yet, Swalwell said, he is happy with the progress being made. "I think we have made tremendous progress in the media, and also in the house and senate investigations that have shown a willingness and an eagerness to work with the Russians," Swalwell said. "I don't think anyone should rush," Harlow said. "But what I am saying is, have you seen anything? Are you saying those e-mails are evidence of collusion? Is there anything classified that you have seen that you cannot disclose what it is right now, but you say, yes, this would prove to the American people, beyond a reasonable doubt, there was collusion?" "Those e-mails are absolutely evidence of an eagerness to collude. 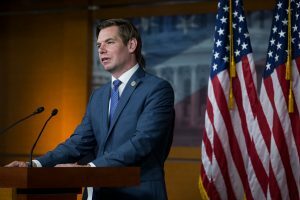 What we're piecing together is whether it amounted to a working relationship," Swalwell said. Swalwell also claimed Republicans are "curious about the wrong things," as was demonstrated by their questioning of former U.S. ambassador to the United Nations Samantha Power for longer than Jared Kushner. The House Intelligence Committee is conducting one of five investigations looking into potential collusion between the Trump campaign and Russian officials during the 2016 presidential election.